Designed for math teachers and coaches in grades 1–8, this self-study guide, now available as a paperback with extensive online classroom video, showcases elementary and middle school classrooms where teachers inspire even the most reluctant students to share their ideas. Lucy West invites teachers into real-life classrooms where all students stay in the game, stay motivated about learning, and ultimately deepen their understanding. This is the new print + online video format. Get details on the DVD and streaming video formats here. For more than 20 years, Lucy West has been studying mathematical classroom discourse. She believes that teachers need to understand what their students are thinking as they grapple with rich mathematical tasks and that the best way to do so is through talking and listening. In this video-rich edition of Adding Talk to the Equation, she invites teachers into real-life classrooms where all students stay in the game, stay motivated about learning, and ultimately deepen their understanding. 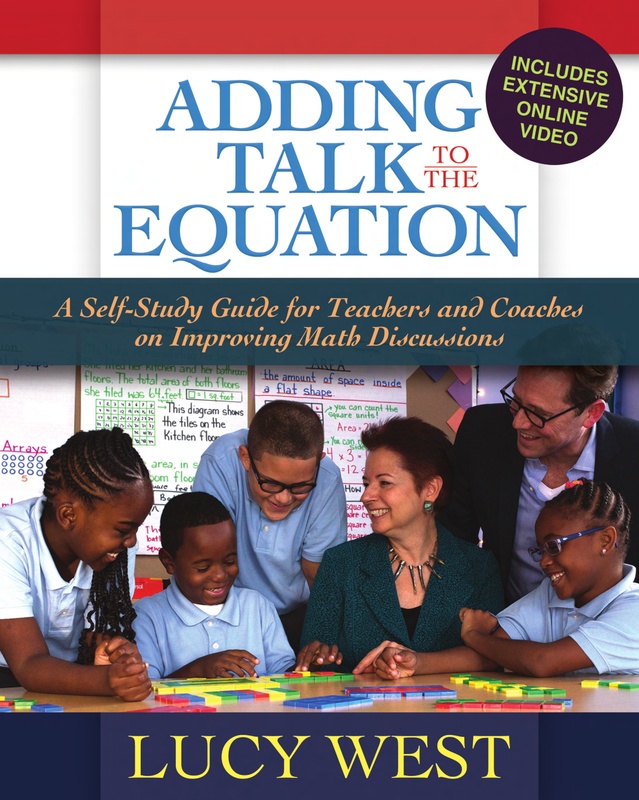 Designed for math teachers and coaches in grades 1–8, this self-study guide, now available as a paperback with extensive online classroom video, showcases elementary and middle school classrooms where teachers inspire even the most reluctant students to share their ideas. Through the stories of skilled teachers, Lucy offers play-by-play commentary as they get more comfortable with new talk moves and learn to tune in and respond to students’ math conversations. Although these discussions occur in math class, the strategies can be used to create a respectful, productive environment for any subject area. This video-based resource examines the importance of creating a safe learning environment; the value of thinking, reasoning, and questioning; the role of active, accountable listening; and the necessity of giving all students a "you can do this" message. Lucy also emphasizes that slowing down, even in the face of time constraints, is crucial for creating a classroom where all students feel they have something to contribute. This guide includes transcripts of the case studies, with insightful commentary from Lucy that gives you a window into her thinking and the complexities of the work she is doing with teachers, as well as her reflections on missed opportunities. Lucy West has worked in education for more than thirty years, starting as a second-grade teacher in New York City, then serving as the director of mathematics for District 2, the deputy superintendent of Region 9, and assistant principal of PS 234. Currently, she is the founder and CEO of Metamorphosis Teaching and Learning Communities, which is dedicated to partnering with districts to design and enact effective professional learning initiatives that result in increased student learning through improved instruction. Lucy is also the coauthor of Agents of Change: How Content Coaching Transforms Teaching and Learning and Content-Focused Coaching: Transforming Mathematics Lessons.